An article from HealthDay boosts the skin cancer research of CU Cancer Center investigator and assistant professor of dermatology at the University Of Colorado School Of Medicine Neil Box. The article claims that there has been an increase in melanoma diagnoses in children living in the United States. It suggests that the number of children with the disease has increased two percent each year for the last thirty years. Children living in Colorado are of concern because they are likely to receive high amounts of sun exposure in comparison to those living in other states. The combination of an active outdoor lifestyle, high elevation, and 300 days of sunshine make people living in Colorado particularly susceptible to sun damage. Coloradans of all ages, but especially children, need to take extra care when they are exposed to the sun in both the winter and summer months to decrease the chances of developing melanoma. “It really is shocking when I hear that a kid went to the clinic,” says Box. “It usually does not happen until the third or fourth decade of life.” Aware of the issue, Box is working in collaboration with a team of researchers in the Colorado School of Public Health to study a population of children and their nevus (mole) development. “We are studying the gene environment interactions that are determining the number of nevi in children,” says Box. “The number of nevi a child has can determine the risk for developing melanoma later in life and they can also be an intermediate on the pathway to this disease.” Box hopes that by studying nevi in children he can learn more about the formation of the disease. Sun exposure is not the only factor that contributes to skin cancer in children and adults; physiological attributions may also play into the increased likelihood of developing the disease. “Fair skin color, red hair color, freckles, and the numbers of moles are similarly risk indicators for melanoma,” Box says. In addition to encouraging sun safe behaviors, parents are able to play an active role in preventing melanoma by being aware of changes in their child’s skin. “It is important to remember that you should not discount changes in nevi just because they are kids; pay attention to the skin of your child,” says Box. 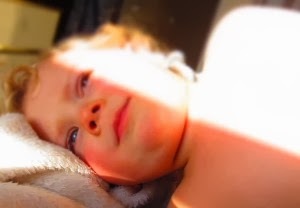 “You should also take into account the ABCDE’s of melanoma and continue surveillance.” He urges that parents consult a dermatologist if they see irregular or large nevi that seem to be changing in size or color. In order to increase awareness and research Box and his team founded the Colorado Melanoma Foundation. This foundation is dedicated to promote melanoma prevention, screening, awareness and research. One area of great interest to them is the genetics behind melanoma. “Melanoma has one of the highest levels of gene mutations of any cancer type,” says Box. “We need to know more about this subject in order to understand things like the timing of molecular events and mutations that are appearing in cells when you get UV exposure.” He hopes that through research there will be a greater understanding of the pathways that lead to melanoma, and how these pathways might determine whether a precancerous melanocyte becomes a harmless nevus or a deadly melanoma.